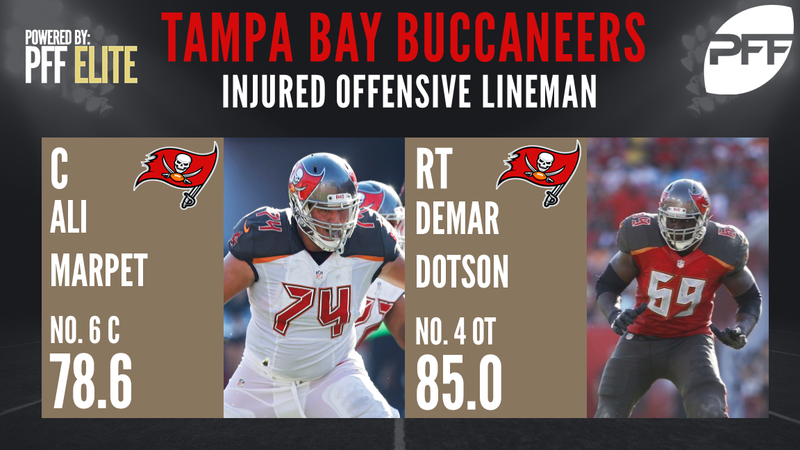 Adam Schefter reports, the Tampa Bay Buccaneers have lost center Ali Marpet and tackle Demar Dotson for the remainder of the season. Marpet and Dotson were easily the teams two best offensive lineman this year, anchoring a unit that appeared improved from last season. Center Joe Hawley and tackle Caleb Benenoch will likely get the nod as the primary replacements. Dotson, the fourth-highest graded tackle with an overall grade of 85.0, was near flawless in pass protection at times, not allowing a single pressure in three games while only allowing one in six. His pass-blocking efficiency of 97.6 was the second-highest mark among right tackles. In his first year at center after moving over from right guard, Marpet struggled to start the season but bounced back quickly. Marpet’s season will be highlighted by a Week 6 performance in which he was the highest-graded center of the week with a game grade of 90.0. His season ends with him currently the sixth-highest graded center with an overall grade of 78.6. Joe Hawley was the teams starting center from 2015-2016 before being replaced by Marpet. His best season was in 2016, where he earned an overall grade of 62.2 and ranked 32nd among centers. Benenoch hasn’t had much live game action since being drafted in the fifth round of the 2016 draft but hasn’t played well in his limited reps.